Don’t miss your chance to explore the cargo space and passenger space of the 2018 Honda Odyssey. This spacious, well-apportioned minivan is as flexible as they come, and we think its luxurious seating and accessible storage spaces will be appreciated by the whole family. Of course, we’re not the only ones who think that Central Illinois drivers will love what they find in the 2018 Honda Odyssey! The experts at Kelley Blue Book have called it “the best family car in the world,” and once you’ve explored its cargo space, passenger space, and interior, we’re sure you’ll agree. 2018 Honda Odyssey 158.0 cu. ft. 163.6 cu. ft. 40.9 in./40.9 in./38.1 in. No matter what life throws at you, you’ll find that the spacious 2018 Honda Odyssey is the perfect vehicle for the job. Its One Motion 60/40 Split Third-Row Magic Seat and removable Second-Row seats make it easier to load up equipment, and when you aren’t travelling with a cabin full of cargo, passengers will enjoy plenty of space. The Odyssey’s baseline LX trim level seats seven, but those who upgrade to the EX trim or higher will receive a Multi-Function Second-Row Center Seat that brings this minivan’s capacity to eight. 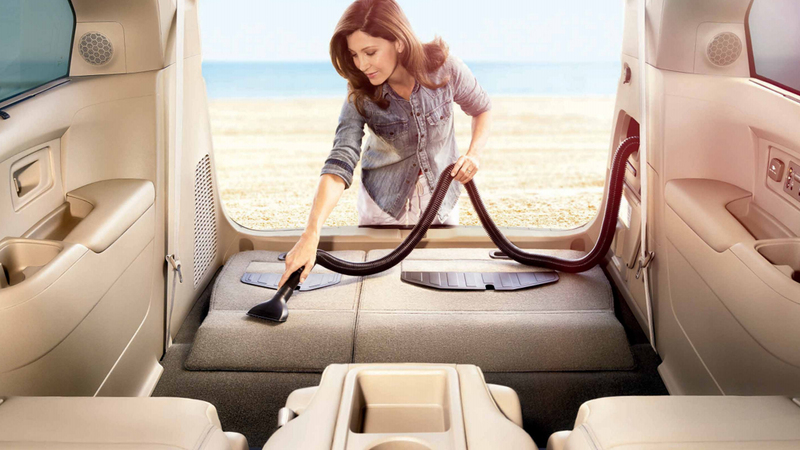 Hands-Free Access Power Tailgate: Loading up your minivan with cargo has never been more convenient! A Power Tailgate with Programmable Height is offered even on the Odyssey’s EX-L trim level—and those who upgrade to the Touring or Elite models will also receive Hands-Free Access technology, letting you open the Odyssey’s tailgate by waving your foot beneath the rear bumper. Small-Item Storage: Keeping your Odyssey clean and organized is a simple job when you take advantage of its numerous easily accessible small-item storage spaces. A Rear Storage Well, a Lockable Glove Compartment, and Passenger-Side Lower Seatback pockets are offered even on the LX, and in the EX, Driver-Side Lower Seatback Pockets are also included. Those who upgrade to the Touring or Elite trims will receive Upper Seatback pockets on both rows of seating. Magic Slide Technology: Every Odyssey trim except for the baseline LX has been designed with Magic Slide Second-Row Seats. These seats can move from the edge of the cabin towards the center, and they even include a Walk-In feature. With the press of a button, you’ll be able to retrieve cargo and access the third row of seating with ease. Driver and Front Passenger Seating: An 8-way Power Adjustable Driver’s Seat and a 4-Way Power Adjustable Front Passenger’s Seat come standard in every Odyssey. Starting in this minivan’s EX trim level, drivers will gain a 12-Way Power Adjustable Driver’s Seat with 4-Way Lumbar Support—and Heated Front Seats, too! A Two-Position Driver Memory function comes equipped in the Odyssey EX-L, and on the high-end Elite trim, the Odyssey offers Ventilated Front Seats. The 2018 Honda Odyssey’s array of standard features leaves little to be desired, but if you’re a driver with unique needs or interests, chances are you’ll find the accessories you need. Those collected here will help you transport a wide variety of outdoors and sports equipment while keeping your interior completely organized. Take the Odyssey for a Test Drive! Now’s your chance to experience the 2018 Honda Odyssey’s cargo space and passenger space for yourself! Start a conversation with one of our experts to learn more about the Odyssey, and begin exploring our current offers. Stop by any Central Illinois Honda Dealer and test drive the Odyssey today!